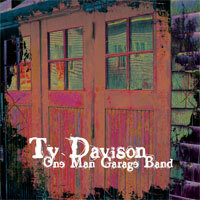 One Man Garage Band is the 2009 debut album by Ty Davison, a Salem, Oregon-based singer and songwriter. The 16 song album features lyrical themes of love and loss, peace and war, and darkness and light set to a dynamic rock and roll soundtrack. The music was recorded using Apple’s GarageBand software on an Apple MacBook Pro using a Roland XP-80 keyboard, a borrowed Korg keyboard (thanks, Dave), a MOTU Traveler, a Griffin iMic, a Shure SM58 mic and a Roland KC-500 amp. I also used a number of Logic Apple Loops for the guitars, drums and bass. The final song, Magic GarageBand, is a “meta song” which describes how to create, in Apple’s GarageBand, the very music I’m singing over. Buy the album in MP3 format at CDBaby or in AAC format at the iTunes Music Store. My wife Erin for giving me the time and the encouragement to do what I love to do; Jonah, Elisha and Jillian for putting up with my incessant piano playing; Gretchen for believing at the very beginning; my late grandmother Norma for her unwavering support of my musical endeavors; Garr for his contagious enthusiasm and his always helpful (if not always heeded) constructive criticism; Dave for his life-long friendship; and Marsha for an album cover and design well beyond my hope or expectation. Finally, my never-ending thanks to God for the opportunity to experience this reality and the love that flows through it. I am so deeply grateful. All lyrics and notes ©2009 by Ty Davison. All rights reserved. Given the terrorism, war and torture that opened the 21st century, it’s not hard to imagine the possibilities for a better world. Some genealogists believe that we are all at least 50th cousins to one another. From that vantage point, we really are “one world.” NWR sets at the forefront the universal concerns of humanity’s future and the hopes that so many of us share. It seems to me that there are worse ways to open an album. Musically, NWR has three things I really enjoy: acoustic guitar, bubbly electronica elements, and a little bit of chaos. If this is one world what is all the fighting for? Listen to a sample or buy New World Redux at the iTunes Store. Kids put together things in ways that adults never would, and they can be adamant about it, which was the case here. “Surely,” I told him, “you mean ‘American Flags. '” Nope. “America’s Flag”? No. Jonah was clear: “America Flags.” This made no sense to me until I stopped trying to use flags as a noun. After that revelation, the song came together quickly. By taking the lyrics to old patriotic tunes and changing a word here or there I could say exactly what I wanted. AF is an indictment of American culture, to be sure, but it’s foolish to think that a patriot must turn a blind eye to what’s wrong in his country. The guitar/organ combination never gets old for me. AF gets a nice groove going then settles out into a wistful piano section before the coda emerges. I think the change of pace is both appropriate for the piece and a good for the album in the sense that if I can go from a relatively rocking groove to quiet acoustic piano, who knows what else is to come? O’er the land of the fee and the home of the paid? Mind the music and the hemp and with the girls be handy! Mind the music and the hemp and let the girls be randy! Another case where the song title came first, this time in a dream. I remember it seemed like such a wonderfully evocative phrase. Everyone knows Shakespeare’s great tragedy, and many of the themes of Romeo & Juliet (love; time; light and dark; fate) are the same ones that I was interested in exploring musically. So I let the Bard tell the tale: Most of the lyrics here are Shakespeare’s. I don’t know how many have felt the compulsion to be with a beloved, endured an arduous journey to be together, and met heart-wrenching disappointment in the end. I have, so EOR has the virtue of being true to my experience. Given Shakespeare’s talent for capturing human emotion, I’m sure I’m not alone. The autobiographical story of my first love. The breakup was extraordinarily painful, but I look back now with gratitude for the times we shared and for who the sum of the experience helped me become. Shattered was the first song I wrote for the album. The opening line (“In a night shattered by stars”) was an homage to Pablo Neruda’s magnificent Tonight I can write the saddest lines, which captures the feeling of love’s loss better than anything I’ve ever read. In Shattered the overriding sentiment is desperation, and desperate people to desperate things, which is who I became and what I did when my world crumbled. An ode to innocence lost, and the idea there is perhaps some knowledge we shouldn’t have. I never ceased to be amazed by people who claim to be unaffected by societal pressures. We are all products of our historical, political and cultural environs, and though the more self-aware among us attempt to transcend these limitations, a goodly number of people never even realize how they are being influenced and manipulated. I despaired for about a year after my first major relationship ended, drowning my sorrows as many are wont to do. I remember so clearly the awful, urgent longing to be with her and the knowing it was not to be. Those who have lived this type of thing understand exactly. It will sound insane, but this was originally an attempt to make a song that would fit in on Moby’s Play. While almost wholly unsuccessful in that respect, I continue to be enamored with this combination of strings, acoustic guitar, woodwinds, piano and female backing vocals. The popping bass isn’t bad either, if I do say so myself. Am I coming to realize there must be more to this life? How come I fall down again? What will I see in the end? Purge might start out sounding like a Creedence Clearwater Revival song, but I don’t think John Fogerty ever went this dark lyrically. We are creatures with an extraordinary capacity for evil as even a casual reading of human history attests. What stops us—or most of us, anyway—from acting on the wicked thoughts of our human nature? Does it matter if it doesn’t show? I wonder if the mind said go would the body be willing? A love song for my wife Erin. For those interested, I “looked out to sea” from atop the Big Dune of Cape Kiwanda at Pacific City, Oregon. Elemental also contains my favorite musical moment on the album, the section about how one can feel all-powerful yet be reduced to nothing without love. From these heights, from these heights I fall without you…. An attempt to capture the feeling of love in a song. The second song I wrote for the album, dedicated to my little girl Elisha Jeanne. I suppose there will be any number of guys wondering what all the hubbub is, but I dare say that those who’ve fathered a daughter know where I’m coming from. What else from your daddy? How is it that all the love you give is free? What did the world do to deserve the likes of you, Elisha Jeanne? A major life lesson I’ve learned as I’ve grown older: Love conquers fear and that faith in that love is sufficient. For me, the consequence of that realization has been enormous gratitude, and that, in large measure, is what I return to in the quiet moments of each day.